Online shopping guide: LidtMereLuksusIHverdagen.dk _ Mathias Vestergaard Corp.
LidtMereLuksusIHverdagen.dk is a personal shopping guide designed and researched by Pernille Skovbjergs home website . The site also is a clear statement about how websites can be more interesting, inspiring and feminine. The website was designed around a somewhat weird metaphor, where an animal represents a partical shop or café. When you click on an animal it flips around and transforms into a post it-note. An animal is also a post it-note. The site was launched in May 2006 and was later updated in December 2006. The site principally was an interactive experience. 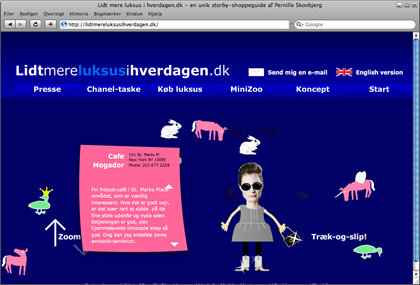 Unfortunately, the website was closed down in November 2008, since Pernille didn’t want to maintain it anymore.